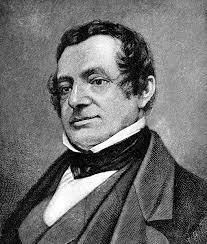 3rd April 1783 was the birthday of the great American writer Washington Irving, one of the first tourists to Stratford-upon-Avon to describe his visit in detail. While living in England he made several visits to the town to see the sites associated with Shakespeare, in 1815, 1821 and 1831. 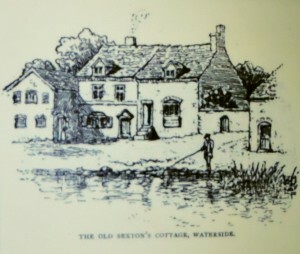 His Sketch-book was published in 1820 and the account of his visit to Stratford exactly two hundred years ago did much to encourage other Americans to follow in his footsteps. 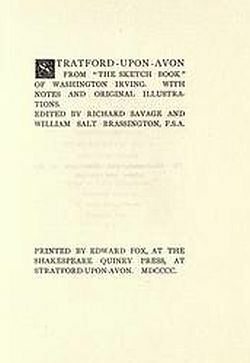 Irving’s essay was so popular that in 1900 an edition was published by Edward Fox at the Richard Quiney Press, edited by Richard Savage, Librarian at Shakespeare’s Birthplace and W S Brassington, Librarian at the Memorial Theatre. The book was dedicated to the town’s Shakespeare Club and notes that it was printed in the house once lived in by Judith Shakespeare, The editors added a preface and many illustrations from the hand-written, beautifully-illustrated transcription of Irving’s essay made by Captain J Saunders, a contemporary of Irving’s. This very local publication was a tribute to Irving’s work, “perhaps the best bit of Shakespeareana ever penned”. 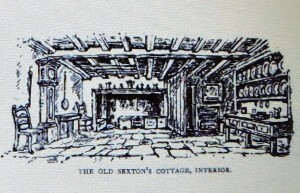 Irving’s description of the Birthplace, in 1815 under the care of the infamous Mrs Hornby, is often-quoted. Irving was spun many a tale, but was disposed to be charitable: “There is nothing like resolute good-humoured credulity in these matters, and on this occasion I went even so far at willingly to believe the claims of mine hostess to a lineal descent from the poet”. He walked out to Charlecote and back: “Under the wizard influence of Shakspeare I had been walking all day in a complete delusion. I had surveyed the landscape through the prism of poetry, which tinged every object with the hues of the rainbow. I had been surrounded with fancied beings; with mere airy nothings, conjured up by poetic power; yet which, to me, had all the charm of reality. I had heard Jacques soliloquize beneath his oak: had beheld the fair Rosalind and her companion adventuring through the woodlands; and, above all, had been once more present in spirit with fat Jack Falstaff and his contemporaries, from the august Justice Shallow, down to the gentle Master Slender and the sweet Anne Page”. Back in Stratford the romance of the Church took hold: “As I trod the sounding pavement, there was something intense and thrilling in the idea, that, in very truth, the remains of Shakespeare were mouldering beneath my feet. It was a long time before I could prevail upon myself to leave the place”. Although some of his descriptions are tongue in cheek, he was charmed by some of the town’s inhabitants. 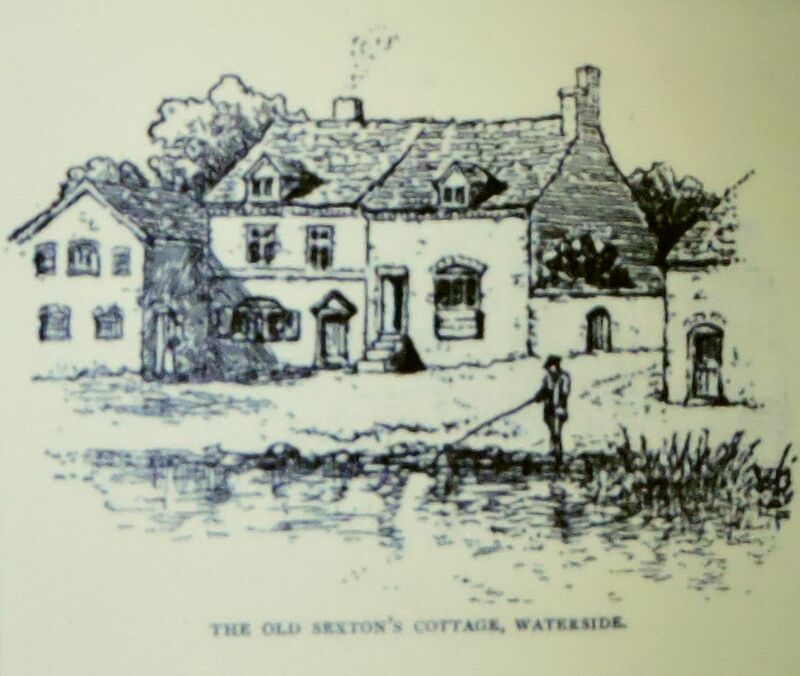 “In the course of my rambles I met with the gray-headed sexton, Edmonds… He had lived in Stratford, man and boy, for eighty years… His dwelling was a cottage, looking out upon the Avon and its bordering meadows, and was a picture of that neatness, order, and comfort, which pervade the humblest dwellings in this country. A low whitewashed room, with a stone floor carefully scrubbed, served for parlor, kitchen, and hall. Rows of pewter and earthen dishes glittered along the dresser. On an old oaken table, well rubbed and polished, lay the family Bible and prayer-book, and the drawer contained the family library, composed of about half a score of well-thumbed volumes…”. Here he also met John Ange, a friend of Edmonds from youth. “The sexton and his companion had been employed as carpenters on the preparations for the celebrated Stratford jubilee, and they remembered Garrick, the prime mover of the fete, who …was “a short punch man, very lively and bustling”. John Ange had assisted also in cutting down Shakspeare’s mulberry tree…” Sadly Irving does not recount more of their stories, but they do give an indication that even in 1815 there was rivalry for the attentions of tourists in the town. “I was grieved to hear these two worthy wights speak very dubiously of the eloquent dame who shows the Shakspeare house. 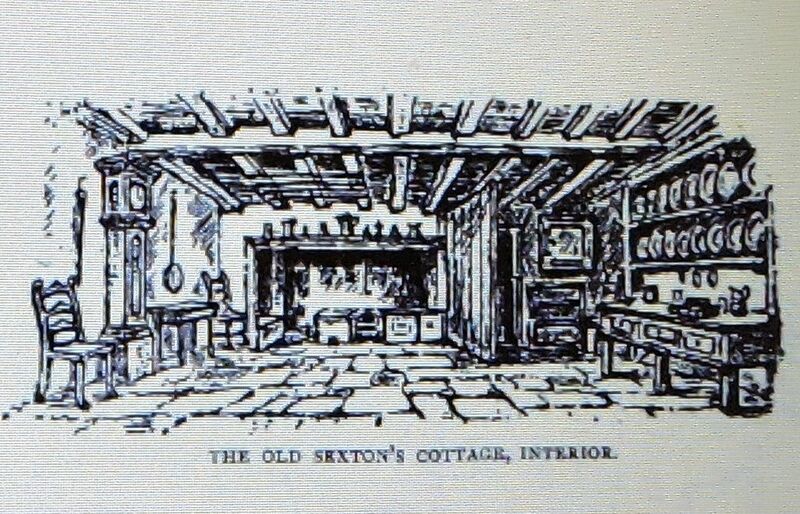 John Ange shook his head when I mentioned her valuable collection of relics, particularly her remains of the mulberry tree; and the old sexton even expressed a doubt as to Shakspeare having been born in her house. I soon discovered that he looked upon her mansion with an evil eye, as a rival to the poet’s tomb; the latter having comparatively but few visitors. Thus it is that historians differ at the very outset, and mere pebbles make the stream of truth diverge into different channels even at the fountain head”. This entry was posted in Legacy, Stratford-upon-Avon and tagged Avon, Charlecote, Holy Trinity Church, Richard Savage, Sexton, Shakespeare Club, Shakespeare's Birthplace, W S Brassington, Washington Irving. Bookmark the permalink.